Mr. Gyros makes their own cucumber sauce (Gyros Sauce), Hummos, Babaganouge, Tahni (Sesame Seed sauce) & Greek Dressing. Privately owned, conveniently located on the north west part of town, we take pride in making the best Mediterranean food in the vicinity. Renowned for its authenticity and the greatest hummus maker, we are proud to serve your next best Pita sandwich. One of America's best hummus & Gyros place in your neighborhood. 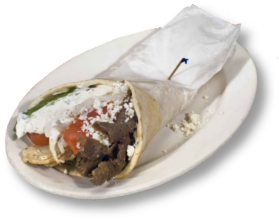 Copyright © 2011 Mr Gyros Restaurant – Drive-Thru & Take-Out. All Rights Reserved.